30th Dec: The team arrived back in Punta Arenas yesterday and will re-arrange their international flights today. 28th Dec: The team are all well and arrived at the Union Glacier yesterday. They are waiting to fly back to Punta Arenas and the flight is planned for tomorrow. 26th Dec: At 2.30pm on Christmas day Chris and the team reached the summit of Mount Vinson. The winds had picked up during the day but didn’t affect the summit bid. They descended back down to high camp and will clear down to base camp today. Well done to all the team and wish them a safe trip off Antarctica and back home. 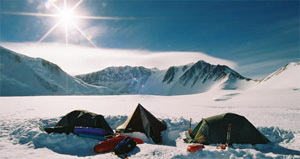 24th Dec: The team are at high camp enjoying a rest day – all are well. The forecast for Christmas day is good, so all being well, they will make their summit bid tomorrow. 22nd Dec: The weather has improved somewhat and Chris and the team have moved to low camp. They plan to carry some gear to high camp today, and move to high camp tomorrow. 21st Dec: Chris rang today – the team are at Vinson Base Camp but they’re experiencing bad weather – 3″ of snow has fallen whilst they’ve been there and they’ve decided to stay put for a couple of days or until the weather gets a bit better – whichever comes first. 19th Dec: The team have now flown onto Antarctica and arrived at Vinson base camp last night. Sadly Tomaz was suffering with flu like symptoms when he arrived in Punta Arenas and they had not improved in the short time they had before flying on to Antarctica. He traveled with the group to Vinson base camp and then flew back with the plane. We wish Tomaz a safe journey home. 17th Dec: The team are all well but the weather has not been favourable so they are still at the Hotel in Punta Arenas waiting for it to clear. They will fly to Antarctica as soon as it does. 16th Dec: The team have now had their briefings and so far the weather is looking good for departure on the 16th. 13th Dec: All the team have arrived safely in Punta Arenas. They will make their final preparations and have their briefings before departing for Antarctica on 16th Dec weather permiting. Go easy on the rations before you leave! Looking forward to the updates. Enjoy it. Hope the weather improves and you get get some great shots from the summit. Great to hear they are on the move again. Congrats to Senan and all the team from Glanbia Hillwalking Club,Ireland. Enda (Crean) O’Brien, grandson of Tom Crean, sends his congratulations also today. Well done, Bob et al!!! Great Christmas present. Safe home. That is really good news for the whole group and especially to my Denali team mate Bob Kerr! Vinson must be a truly memorable and magnificent peak in a unique environment, well done guys.